Revision knee replacement surgery involves replacing part or all of your previous knee prostheses with a new prosthesis. 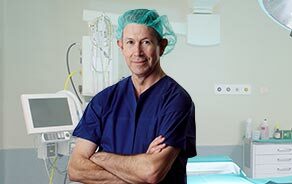 Although total knee replacement surgery is very successful, sometimes the implants can fail due to various reasons and require a second, or revision, surgery. During total knee replacement, the worn cartilage and bone is removed from the knee joint and replaced with artificial components. Artificial knee joints are usually made of metal, ceramic or plastic and consist of the femoral component, tibial component and often a patellar component. The surgery is performed under spinal anaesthesia and sedation. Your surgeon makes an incision over the knee to expose the knee joint. 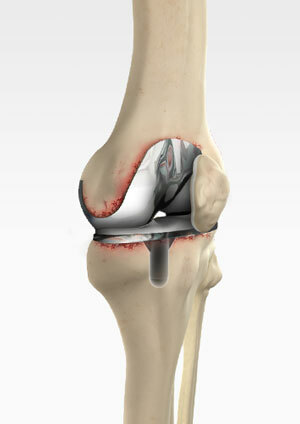 The kneecap along with its ligament is moved aside so that there is enough room to perform the operation. Then the old femoral component of the knee prosthesis is removed if necessary. The femur is prepared to receive the new component. In some cases, a bone graft or a metal wedge may be used to make up for lost bone. Next the tibial component along with the old plastic liner is removed. The tibia is prepared to receive the new component. Similar to the femur, any lost bone is replaced either by a metal wedge or bone graft. Then, a new tibial component is secured to the end of the bone using bone cement. A new plastic liner will be placed on the top of the tibial component. If the patella (kneecap) has worn away, your surgeon will attach a plastic component. The tibial and femoral components of the prosthesis are then brought together to form the new knee joint. Following revision knee replacement surgery you can walk with crutches or a walker. You will be sent for rehabilitation within a couple days of surgery if it's unsafe for you to go home. A physiotherapist will teach you specific exercises to strengthen your leg and restore range of motion to your knee. Your physiotherapist will also provide you with a home exercise program to strengthen your thigh and calf muscles. The aim of revision knee surgery is to improve mobility and to enable you to return to normal activities with a pain-free knee.